Years ago I attended a sales training for professional services folks, where the trainer asked, “What makes you special?” 36 out of 40 in attendance stated some form of the same answer: excellent customer service. 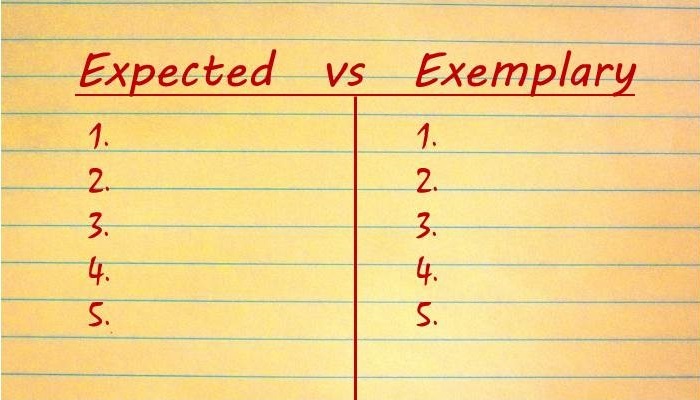 It proved a point that the trainer was trying to make: the difference between Expected and Exemplary. In this example, a customer who goes with a smaller professional services firm expects excellent customer service. Experiencing excellent customer service is no longer considered exemplary. Without excellent customer service you don’t get invited to the table to bid for the business in the first place. This concept applies to teams, as well as individuals and companies. His boss explained that everything under Expected is non-negotiable and considered par-for-the-course to be part of the team. It started with some basics, such as: Show up on time, honesty, transparency, integrity, proper dress, respect for colleagues, etc. When he asked his boss about the items farther down the list, his boss smiled and said, “Good… you’re already starting to get it…” He explained that once an item has been listed under Exemplary for more than a year, it automatically gets moved under Expected because the team is constantly improving and raising the bar. That’s when he realized that he was on a high-performing team. He took this to heart. In his first year, he exceeded his goals by 32% and became #1 on the team. In his second year, they reset the goal to what he achieved the previous year, and he beat that goal by 37%. Once again, they reset the goal to what he achieved the previous year, and he exceeded that goal by 45%. He also found a way to take their 12 step process down to 7 steps. And he created a new method to gain client commitment faster, which also increased their quality scores along with revenue. When he resigned to go start his own business, his boss told him, “The rising tide raises all boats…” His boss told him that his presence on the team made everyone better. He told his boss it was them that made him better. That high-performing team pushed him to want to succeed, to find new ways to get more done in less time, and blow their goals out of the water. Stay up to date with news from Nast Partners! Copyright © 2019, All Rights Reserved - Website by BizMarquee.com, Inc.